Soak the chana dal for 5-6 hrs or over night in enough water. Drain the water form chana dal and wash prpperly. Grind the chana dal, cumin seed and green chilli with very little water and make a course paste. Add salt and coriander leaves in dal mixture and mix well. Boil water in a wide open pan with pinch of salt, then add the rice flour/powder in boiling water and mix it well. Swith off the gas and keep it aside. Transfer the rice mixture in a bowl and mix it well with hand till it become smooth like chapati dough. 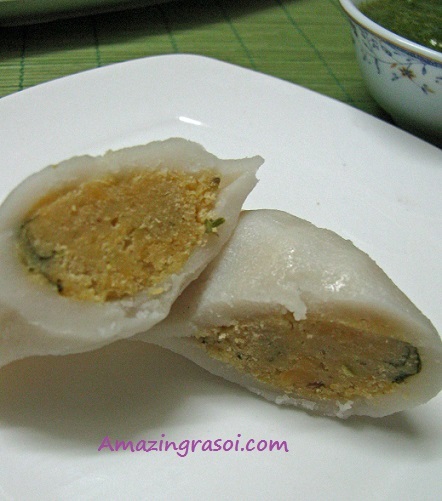 Divide the dough into small size ball. Press the ball in the middle of the dough and put the dal mixture into it. ( as shown in pic). 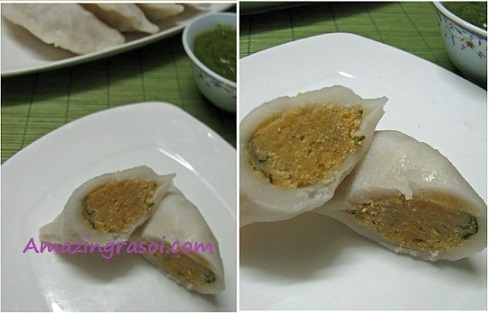 Steam these pitha in steamer 20-25 mins. If rice mixture is dry then add little warm water to make smooth dough. If rice mixture is quite sticky then add little more fice flour/powder. Do not add to much water while grinding dal otherwise it will be difficult to stuff it.